(P1) Do you like Swiss cheese? Do you know why there are holes in it? It is not because of hungry mice. It is because of hay. (P2) A little bit of hay gets into the milk. When the milk turns into cheese, the hay makes the holes. 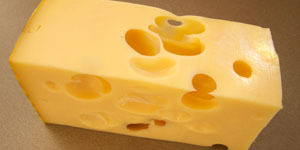 (P3) In the past, the holes in cheese were bigger. More hay got into the milk, then. Today, milk is much cleaner. Do you like Swiss cheese? Why or why not? Did you know hay was in Swiss cheese when it’s made? Will you continue to eat Swiss cheese? Why or why not?